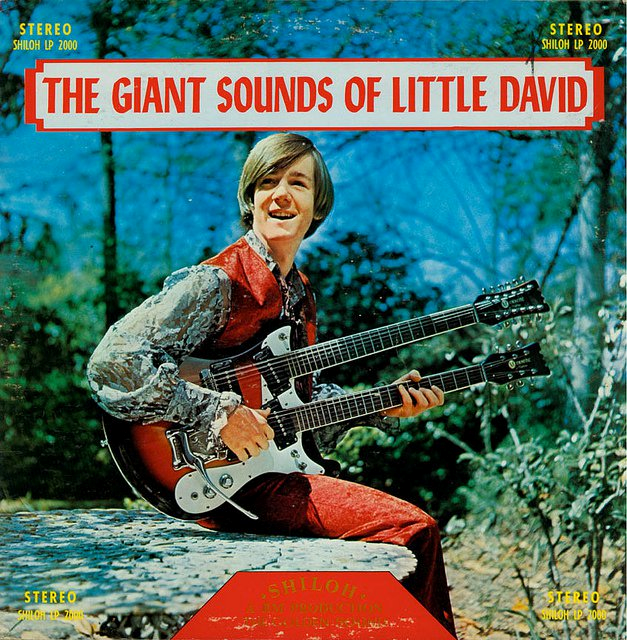 “The Giants Sounds of Little David” is a lurid and wretched album totally unknown by the masses. Released sometimes in the 70s, in an era where Glam Rock was filling the air. Little David, like many other teenagers of his time embraced with enthusiasm this movement and wrote without thinking twice this viscid record. This instrumental piece of work features the best tracks that Little David recorded in his whole career, “Let’s go to the Hash Bar” is probably the most famous of all tracks. Little David experimented with his double neck guitar landscapes that no other musician have visited before. Glam Rock riffs clash with the funky-upbeat chords which seldom remind us some classical-neo realist music with an almost semiotic approach. Little David has no shame to advertise his interest in drugs, “You can always find cocaine between my teeth” is another example where the young guitarist is mixing some well known blues riffs with some Cuban style rhythms. The closing song of the album (“Uncle Booze”) is one of the longest instrumental piece ever written by this very stoned guitarist. The album is nowadays impossible to find, no songs on the internet, rumors say that Little David himself filled with shame and disgrace has deleted with rage and fury all the traces of this frigged and fetid record. But the lucky owners of the few printed copy of this fulsome vinyl may decide one day to upload some of the tracks on the internet, I certainly hope so but until then it’s all wrapped up in a mystery which only Little David and those few lucky fans can enjoy at best.